Last night, we went to watch Ben Kenwright’s stage adaptation on one of paramount’s highest grossing films, ‘Saturday Night Fever.’ The scene is set in Brooklyn, New York where the 19-year-old Tony Manero (Richard Winsor) is working in a dead-end job and still living at home with his squabbling parents, including a sorry excuse for a father. Feeling restless and frustrated, Tony turns to disco dance as an outlet, spending his weekends in club 2001 Odyssey. When Tony hears about a dance competition offering a $1,000 prize, he doesn’t have to think twice, this is the opportunity he’s been waiting for. Que the ladies. His moves and charisma attract the attention of Annette (Anna Campkin) and strong minded Stephanie Mangano (Kate Parr), who eventually agrees to become his dance partner, much to the dismay of Annette. The film budget was $2.5m but went on to gross $285m (£217.5m), propelling John Travolta to stardom. John Badham (Director) was quoted as saying “If you’d told me 40 years ago we’d still be talking about it today, I’d never have believed you.” (38 years old at the time). 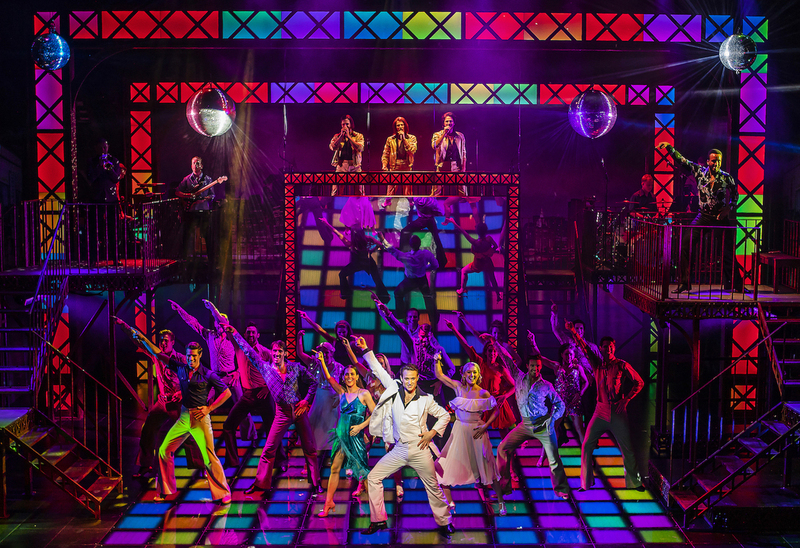 The film paved the way for disco madness and the Bee Gees soundtrack became one of the best selling movie soundtracks of all time. Songs include ‘Stayin’ Alive’, ‘Night Fever’, ‘How deep is your love’, ‘More than a women’ and ‘If I can’t have you’. Winsor really does capture Tony’s innocent arrogance, creating some lovely amusing moments, particularly in his attempts to try and win Stephanie affections. I did however feel this wasn’t quite as well reflected through Winsor’s dance performances, as it was acted. Winsor showcased an infusion of both contemporary and disco styles, perhaps down to Kenwrights ‘reimagined’ adaption. Whilst this was different, I felt this resulted in loosing elements of Tony’s ‘edgy’ and ‘street-wise’ persona. Winsor and the cast don’t miss a beat, something which they can’t be faulted for, however ‘something’ was missing. I was particularly drawn to cast member and dancer Javier Cid who perhaps had ‘that something.’ Parr worked well with Winsor and had an incredible voice on the two occasions when she sang. Tony’s ‘boys’ were likeable and fun, with Raphael Pace pulling on the audiences heartstrings in his portrayal of ‘Bobbie C’. I really enjoyed the addition of a live band and Bee Gee impersonators on the stage throughout. Costume designer, Gary Mccann also gets it bang on with low-cut, v-neck shirts, funky flares and iridescent, sequinned jumpsuits. If you fancy reminiscing back to the 70’s then this will definitely take you down memory lane.